Sometimes a blast of the past will help you realize how fast time blast pass you. Yes these are the Hayes Homes. I spent my summers growing up there in the sixties. Times were different then, I loved being there and I'm looking for any and all pictures. I stayed at 342 West Kenny St right off of Springfield ave. This is Hayes Home, I know my family was one of the first to move in 1954, 326 Hunterdon St. near Springfield Ave. Yes this photo is of Hayes Homes. 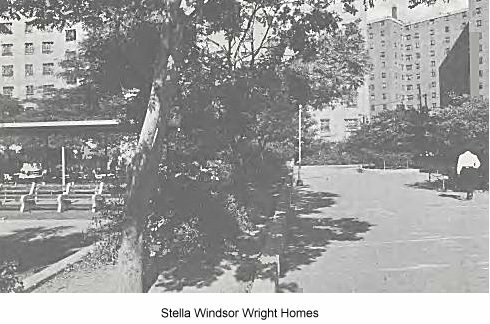 The other photo is Stella Wrights. Stella Wrights has corner windows. I was born in Hayes Homes in 1968 and left in the 90's. 342 W Kinney Street. Across the street from Al's Grocery Store. We played in the "big field" and hung out in the Field aka four house. Hey CW I wanted to reach out to you when I read your comments that you lived at 342 W Kinney St. I spent my summers there thru out the 60s with my Grand mother and Uncle in Apt. 2c. 1968 was the last summer I spent there but I to have wonderful memories of playing in the big field. I was wondering if you came to know a buddy of mine nick named smoochie. His family lived on the second floor of 342 he had a younger brother named Sean and a sister named Toni and Midge. Any help Brother would be appreciated.